Fabulous oil for muscular aches and pains. Betula lenta is a medium-sized deciduous tree reaching 66ft tall with a trunk up to 2ft diameter. The twigs, when scraped, have a strong scent of wintergreen due to methyl salicylate, which is produced in the bark. There are between 30-150 species of Birch trees. Sweet birch is also commonly referred to as black birch or cherry birch. When exposed to air it darkens to a color resembling mahogany. Birch essential oil is extremely grounding and centering. 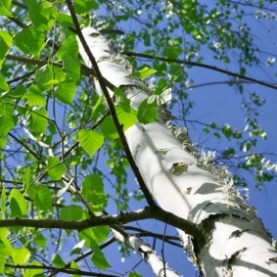 Birch works on the third chakra, renewing our sense of strength and power. When we are feeling too much influence from others or circumstances. Birch can help us to remember our true and authentic self. When we want to call our energy back from the fragments we have left "out there", Birch will hep us to regain our "wholeness". Birch essential oil is composed primarily of one chemical component, methyl salicylate. Methyl salicylate is analgesic, anti-inflammatory, anti-spasmodic, rubefacient and anti-rheumatic and is therefore effective for muscle & joint pain relief. 5ml of Methyl salicylate is equivalent to 21 asprin.There are many Safety concerns with Birch essential oil, please see Safety Information before using this oil. Birch Essential Oil is Potentially toxic, it contains methyl salicylate, (the active ingredient in aspirin). Not to be used for anyone on blood thinning medications, the elderly or fragile. Not for use when pregnant or nursing. Avoid in cases of liver problems. Possible skin irritant - dilute well. Avoid contact with any open wounds or mucous membranes. Smells a bit like candy (wintergreen). Keep away from children, due to the possible risk of developing Reye's Syndrome. According to Tisserand & Young, hazards associated with Birch essential oil are: possible drug interactions, inhibition of blood clotting, toxicity, high doses may be teratogenic. Contraindications: Anticoagulant medication, major surgery, hemophilia, other bleeding disorders, breast feeding, pregnancy, gastroesophageal reflux disease. Should not be given to people with salicylate sensitivity (this often applies to those with ADD/ADHD).